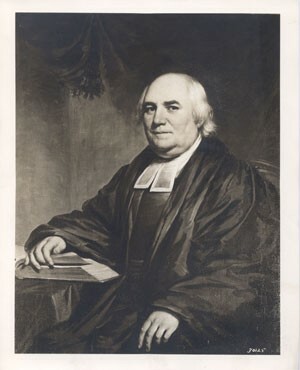 William Harris, a Harvard graduate and Episcopalian minister, was elected president in conjunction with the appointment of Columbia College’s first provost, a newly created office to which John Mitchell Mason, a Presbyterian minister, was elected. Administrative duties were shared between the two offices although most of the executive activity was vested with the Provost leaving Dr. Harris with ample time for his duties as Rector of St. Mark's in the Bouwerie. Following Mason's resignation in 1816, a new provost was not appointed and Harris, resigning from his rectorship, assumed the full duties of the office until his death in 1829. The ever-present problem of money haunted Harris's administration and, as a result of repeated application to the Legislature for financial assistance, the Elgin Botanical Garden (now Rockefeller Center), conveyed to the State by David Hosack, its creator, was assigned to Columbia College (1814). Though the condition was made that the College move to this site, this was never carried out. Instead, wings were built in the original building to take care of the growing institution.